Please review and share your ideas with our team. Thanks for your support. 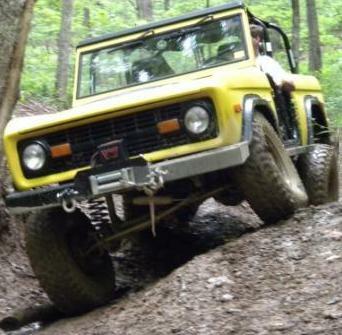 The Daniel Boone Backcountry Byway (DBBB) is a high clearance 4wd route comprised of improved and unimproved county and public roads over 100 miles long centered around the scenic Red River Gorge and Daniel Boone National Forest in eastern Kentucky. * The DBBB is of moderate difficulty and open to licensed vehicles only. It is designed for entry level off-roading and providing a safe and rewarding driving experience. *. Historically, this area of Kentucky hosted the Jeep Jamboree for many years, as far back as 1969. In 2004, a travel management rule change by USFS closed off many of the routes and ended the organized events. * Tourism was a huge part of the rural economy of the area and the loss of access equaled a drop in economic input both direct and indirect. * Since the mid-2000's, a concerted effort between SFWDA members, five local counties, and USFS resulted in the DBBB. Some of the important routes previously utilized by the Jeep Jamboree are now open and drawing organized events and support. *. The DBBB was launched in 2016. SFWDA supported the development of a digital map of the DBBB which allows users to navigate these beautiful 4wd roads with smart phone technology. The DBBB Facebook page has over 3200 followers and some posts have reached 10k. * The roads are part of the historical county transportation systems which make the right-of-ways county property and allows access to the public. * A few recent challenges to the public access of these roads have arisen due to the increased traffic of the DBBB. None have resulted in a loss of access due to support from the counties and SFWDA's grant program, which has provided generous financial support in the form of legal fees and road maintaining resources. * There are 50-100+ miles of expansion of the DBBB planned to meet the growing need of the OHV community for entry level experience. * The DBBB is within 5 hours drive of the northeast megalopolis which represents 17% of the US population or roughly 50 million Americans. It is also convenient to southern states as well. * Future financial support of the DBBB is critical to sustaining and growing these world class OHV opportunities. "If you didnt buy your 1st gen 4Runner new, then YOU are a newbie!!" Daniel Boone Backcountry Byway looks interesting. Noticed Cartotracks has a map, need to get a report from Jake about it. 302, EFI, NP435 4sp, 3.5" lift, 1" body, locked d44 and Locked 9"
Aside from five years of King of the Hammers course maps, DBBB is our best selling map. I will be in southern Utah on Monday and likely will not have cell phone or internet service so I will not be able to participate in the Leadership meeting. I wanted to make you and others aware that Windrock Park cleared and graveled an additional 13 acres next to our event area called Windrock Hollow. We used these new areas for our Shindig this past April. These combined with the existing 17 acres of Windrock Hollow make for a large area that can be used for camping, parking etc. Combine this with our campground, there is lots and lots of room for large events. Windrock Park is continuing to expand. We currently have 25 cabins and just started construction on 5 more. All that being said, I hope that Windrock Park is still being considered for Dixie Run 2019. Below is a link we used before the Shindig which is drone footage of that shows the new cleared and graveled areas. If you have any questions, feel free to let me know. Thanks to all that shared the time and inputs in our meeting last evening. Attached are the minutes from our discussions and also a PPT of the slides. Please share with your groups. If you have any questions, please contact me.